Your team’s ability to pass the ball accurately, using the correct technique will have a major impact on the flow and effectiveness of your offense. Spend time at every practice working on basketball passing drills. Teach your players each of the key passing techniques, and help them understand when and where to use each one. The most common pass in your half court offense will be the two hand chest pass -typically 70% to 80% of your passes will be thrown this way. It’s the surest pass, and it directs the ball well, off screens, or with ball reversal. The important thing to remember when throwing two handed chest passes is step to the pass and meet the pass. The advantage to putting both hands on the ball instead of just pushing it with one is that it allows more effective fakes. The passer can begin a pass, and if there’s overplay, and bring the ball back without releasing it. Since we’ve got full control with both hands this makes it much easier to fake the chest pass and hit a player on a backdoor cut right after. 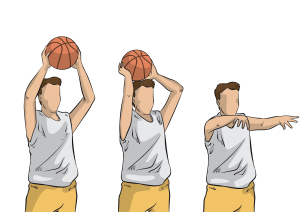 Another useful passing technique is the over the head pass, or lob pass, which is also useful as a post entry. If the post defender is playing on the high side, and the passer has the ball on the wing, we can lead and direct our post player to the basket. We’ll try to throw to the inside of the backboard on set plays, which allows the big man to catch the ball high, keep it up over his head, and finish strong without getting stripped. The bounce pass will be your most common technique for post entry, especially if the post player has his defender sealed behind him. It allows your player to hold off his defender while receiving the pass low, with much less risk of the ball being tipped or intercepted. On the perimeter, the bounce pass can also be used if your wing player is outside being over played on the wing. He can come out to the ball, and if denied, make a quick backdoor cut, receive the bounce pass in stride and score the layup. The skip pass -while prone to interception -is a great way to reverse the ball from one side of the court to the other. If the ball is on one side of the court, and the weak side defender is way over in the key in help defense, you can direct a quick skip pass over his head. It will work almost like a screen, forcing the defender to come on a hard close out, giving you the opportunity for the shot or to take it to the hoop. We can also throw the skip pass with a screen (called a fade screen). 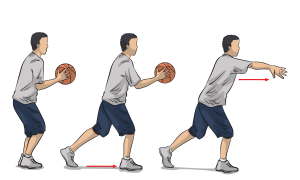 Instead of curling hard to the hoop, the offensive player will step off, fading away along the three point line – this is a perfect opportunity to use the skip pass. Below, we’ll dive into a series of fun and effective drills you can use to improve your team’s passing skills. These drills will focus on passing fundamentals, skills and strategies in the half court. If you’re interested in full court passing drills, check out the transition drills section. If you want cut down your turnovers, improve your passing, and develop a crisper, more effective offensive attack - then the Perimeter Skill Development Drillbook is just what your team needs! 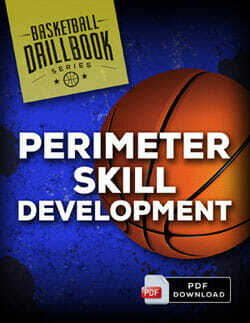 Inside, you'll discover 21 simple, fun and effective drills for shooting, passing, and ballhandling. You'll get instant access to an entire season of practice ideas for every age and competitive level... from basic fundamentals to advanced in-game strategies and tactics. 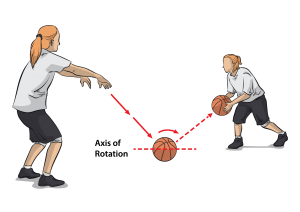 Purpose Players focus on executing a proper flick pass and follow-through. Drill Setup Players form four lines. One on each of the elbows, and one on each of the blocks…. this is the kind of quick reference package i have been waiting to see Than You !